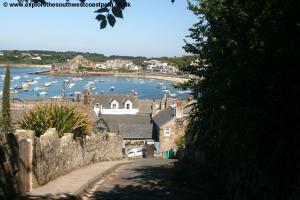 St Mary's is the largest of the Isles of Scilly and has the islands capital, Hugh Town. 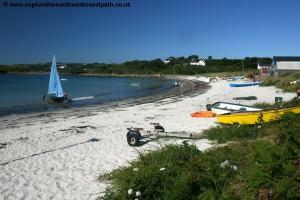 Hugh Town occupies the low area of the island and has sandy beaches on both sides. 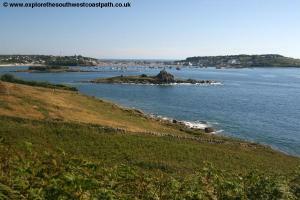 To the east the main island has a mixture of rocky cliffs and sandy beaches whilst to the west the Garrison is mostly rocky, with a garrison wall running around it. St Mary's being the main island of the archipelago has the main town Hugh Town and as such has regular boat services from the other islands (usually daily). In addition there are connections with the mainland. 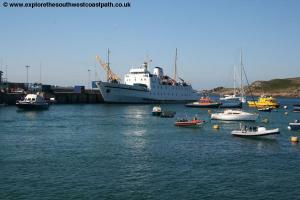 The ferry, Scillonian III operates from Penzance to St Mary's and runs Monday – Saturday from late March to late October or early November. 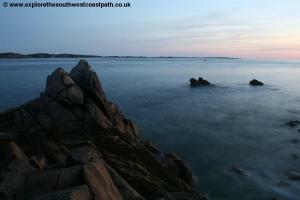 Crossing is usually early morning from Penzance and depating late afternoon from St Mary's. 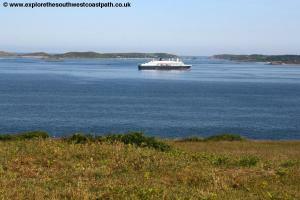 The timetable can be obtained from Isles of Scilly Travel. 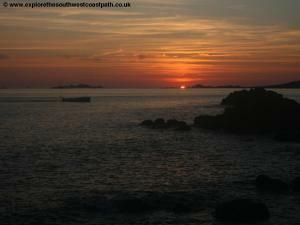 Skybus operate year round flights to St Mary's from Lands End and Newquay. During the summer months they also operate flights from Exeter, Bristol and Southampton. Finally British International Helicopters operate a helicopter service from Penzance all year round, although this service will be moving to depart from Newquay rather than Penzance during 2012. 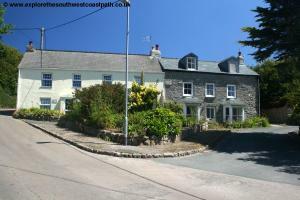 Being the largest of the islands, St Mary's offers the best choice of accommodation. The island has 5 hotels, The Atlantic Hotel, The Bell Rock Hotel, The Schooners Hotel, The St Marys Hall Hotel and The Tregarthens Hotel. 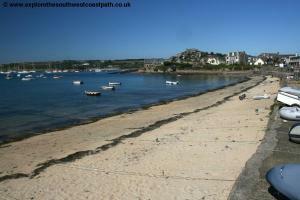 There are numerous Bed and Breakfast and self catering properties which are listed on the Isles of Scilly Travel Accommodation page. There is also a campsite, The Garrison Campsite. 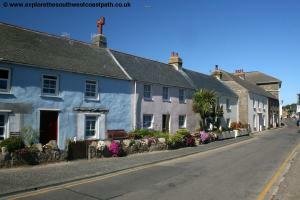 This walk begins from the capital of the islands, Hugh Town. Begin from the main street through Hugh Town, Hugh Street. 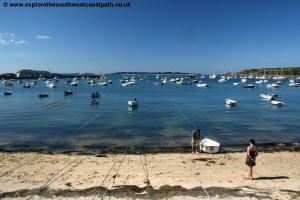 To your left is Town Beach, a good sandy beach but awkward to access with the numerous ropes tied across it from the boats in the harbour. Continue past the post office on the right and the Co-Op on the left. As you come to a junction ahead, turn left along Lower Strand with the park on your right. 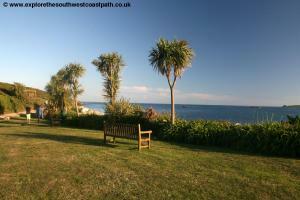 Continue along this road and you soon have another pleasant green on the left, which fronts onto the beach. From here you have lovely views over the towns harbour. 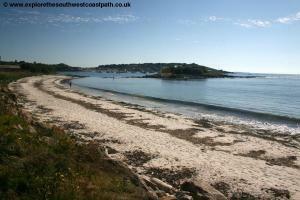 Continue along Lower Strand to the little headland on the left at the end of the town beach. There is a lifeboat station on this little headland, but the path around it is a dead end at the lifeboat station, so stick to the road here. 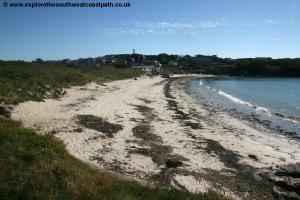 Continue uphill past the secondary school on the right and then soon drop back down to another fine sandy beach, Porth Mellon beach. 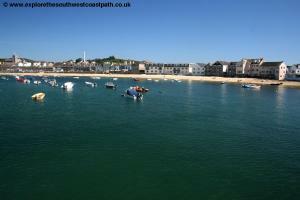 You pass some boat houses on the left, used for storing the Gig racing boats, a popular past time on the island. 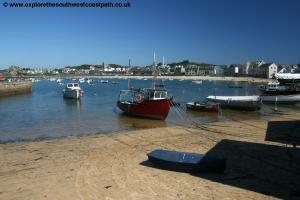 Just as you pass the first of these boat houses, fork left on the path that leaves the road and runs along the back of this pretty beach, which offers fine views back over Hugh Town and the harbour. 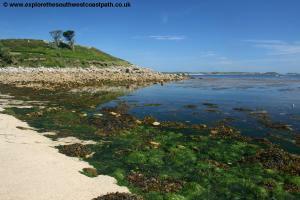 Follow the low path along the back of the beach and at the end of the beach keep to the main (left most) of the paths to follow the cliffs along the north edge of the beach. 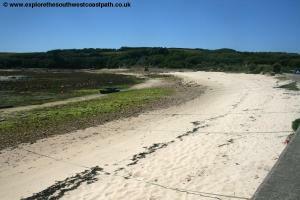 Soon you come round to another good sandy beach, Thomas Porth. 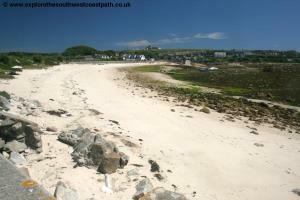 Keep to the main path along the back of the beach, passing the gardens of some houses on the right and soon joining the road through the village of Porthloo. Keep on the road ahead which soon comes down to a little boat yard. Go straight on and pass along the back of another sandy beach. 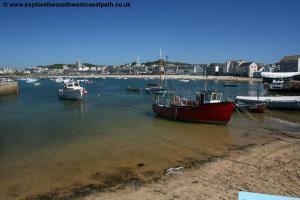 Porth Loo. There is a small grassy island just off the coast here (although connected at low tide) although it is private, so do not try to cross out to it. Keep on the road as it turns slightly to the right and a little back from the coast. When the road splits, keep to the main road fork to the left. When the road forks again a little ahead, keep straight on with the main road, the right most of the forks. You are now by the cafe at Juliets Garden. Do not enter, but take the path just to the right of the garden and go through the gate straight ahead, on the footpath passing the garden (a cafe) on the left. The path soon passes through fields but keep straight ahead here until you leave the fields and the path forks. Take the left most fork heading to a rocky area, Carn Morval Point. 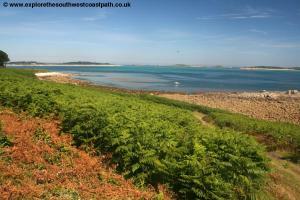 Keep ahead here and follow the coastal footpath that now runs right along the coast. 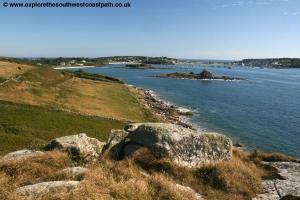 Soon you have an area of bracken on the right and here you keep to the most coastal of the paths, that soon turns a little to the right away from the coast and joins a wider track, which you turn left along. This track soon splits into a number of small paths. Initially take the path to the left and then when it splits again, fork right to enter a field. Walk along the right hand edge of these fields to leave the field onto a road just by a farm. Turn left along this road, passing the farm on the left and then at the junction of tracks ahead, turn left and when this splits again a short distance later, take the centre path heading due north. 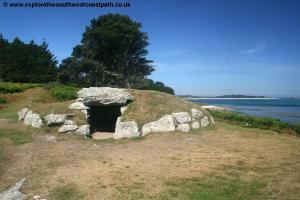 This soon brings you to a very well preserved chambered Cairn, an ancient burial chamber. Continue passing this on the left and keep with the track as it turns to the right, soon re-joining the coast by a small splipway. 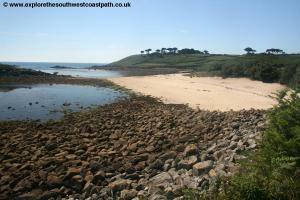 Continue on the narrow path along the back of the beach to reach Bar Point, the northernmost point of St Marys. 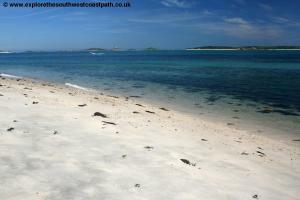 Here there is a beautiful wide sandy beach and views north to St Martins and Tresco. Continue on the wide path along the back of the beach here which soon joins a track, where you turn left to maintain the same direction along it. As this turns to the right to head inland, fork left on a narrower path to pass another chambered Cairn, an ancient burial chamber. 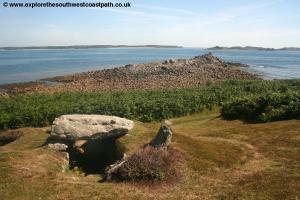 Continue on the path, passing a second of these chambered cairns. 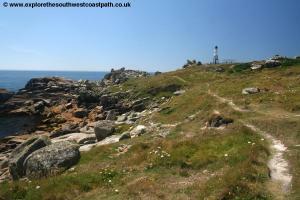 When the path splits ahead, take the left most fork keeping close to the coast. 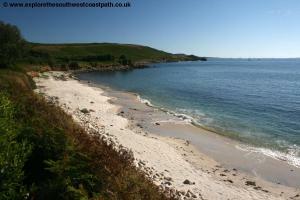 Follow this round the coast to come to the sheltered beach at Watermill Cove, a lovely sand and shingle beach. 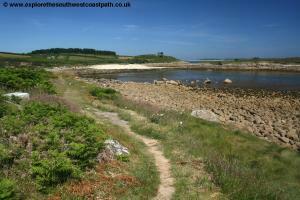 The path heads inland from the beach and then turns left, to round the back of the beach and return to the coast. This passes another little slipway on the left and rounds the headland, to keep with the coast as you turn right and head south. 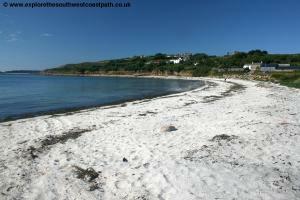 This soon comes to another sandy beach, Pelistry Bay. 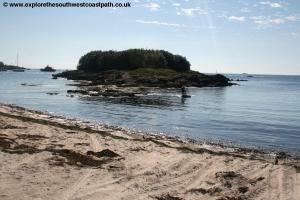 Just off the beach is a little island, Tolls Island. 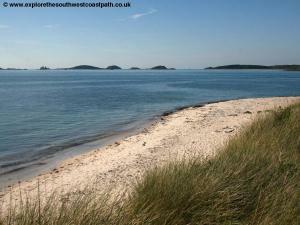 It is possible at low tide to cross onto this small island which offers fine views over the neighbouring islands. 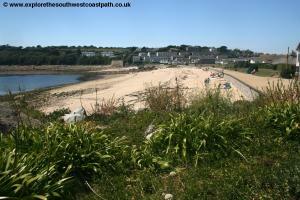 The path here goes along the back of the beach and at the south edge of the beach you rejoin the footpath running right along the low cliff top. 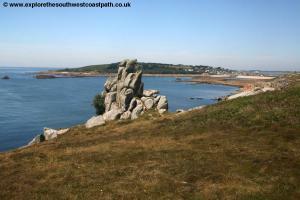 Follow the most coastal path ahead as the coast becomes more rocky and you pass through some rocky areas of heathland. 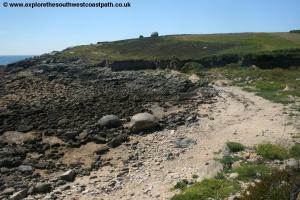 Soon you come down to the small beach of Porth Wreck, presumably so called because of ship wrecks. Rounding this beach, you continue on the coast path right on the cliff top soon coming round to another sandy beach, Porth Hellick. 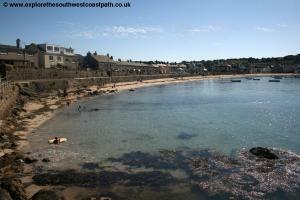 The beach goes along way back into the coast here and at low tide this bay empties of water, revealing numerous rocks. 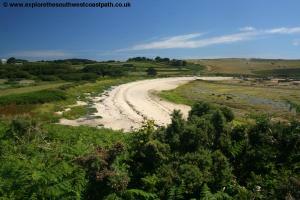 Take the low path around the beach passing through sand dunes at the back of the beach. 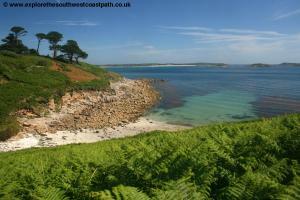 Take the low coastal path now along the west side of this beach along the cliff tops. Soon you reach the end of the airport runway and here there are warnings not to cross if the light is shown or sirens sound. 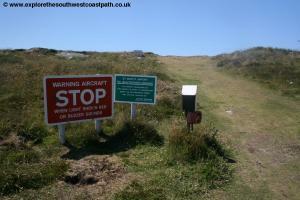 Assuming all is clear, continue on the path passing the end of the runway and keeping to the main coastal path beyond, right on the cliff top. 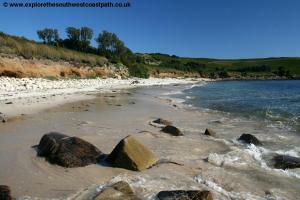 This brings you round to a pebble beach, Church Porth. Round the rocky little headland and then continue on the track that soon becomes a minor road as you head round into Old Town Bay. 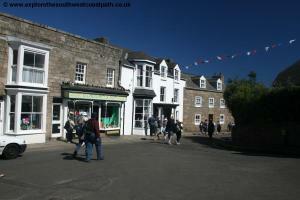 This was once the main town on St Marys, but as the Garrison area was fortified, Hugh Town began to develop and soon became the main town on the island. Keep on the track around the side of the beach, soon reaching the road. Turn left along the road along the back of this good beach, and as the road forks off to the right away from the coast, take the path along the back of the beach. 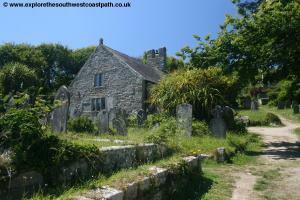 This soon heads past the pretty church and then follows the coast out to a little rocky headland. 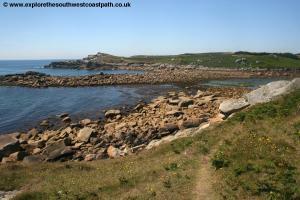 Round this and head out onto the open and rocky land of Peninnis Head. 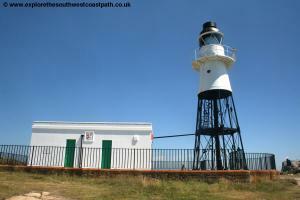 At the far end of this headland you come to a lighthouse, an unusual design which seems to be mounted on stilts. 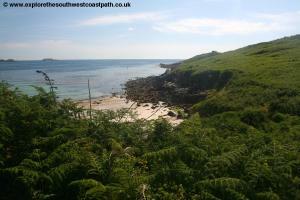 Continue round on the main coastal path to approach Porth Cressa beach. 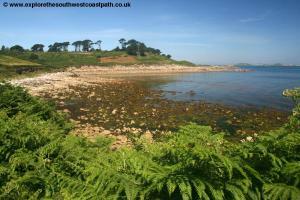 You soon approach an area of allotmenets and the path used to go the coastal side of these but has now been lost to erosion. Instead take the path along the back of these allotments and then turn left on the track through the allotments (there is a sign here warning that the allotments are private, but someone has added a helpful arrow pointing left along the path). 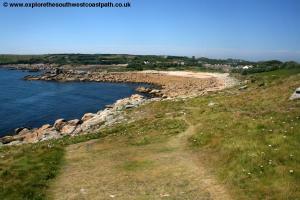 Returning to the coast the other side of the allotments you soon come to a childrens play area and a path up to the right leads up to the Porthcressa tower, which offers fine views over the bay and coast. Continue on the main promenade path onto a grassy area, soon passing the shelter and toilets on the right and continue along a grassy area. 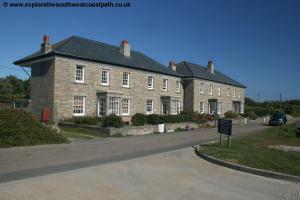 As this grassy area ends, head inland onto the road and follow the road past some houses on the left and a car parking area on the right. This heads up hill to some flats, where you turn right along the narrow road. When you come to a junction with Garrison Lane on the right, take this road and at a T-junction fork left along Garrison Lane. When this joins Garrison Hill, turn left along it going through the narrow archway leading into the Garrison area. Pass the first house on the left and then fork left along the path and keep to the left most fork of this path. 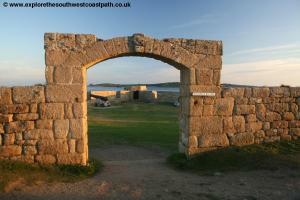 You now follow the path adjacent to these garrison walls with fine views over Hugh Town. From here you can clearly see that the town is a narrow peninsula with coast on either side and higher ground on each side. Soon you pass a grand old building on the left, with cannons on the right. Continue on this track past the last few buildings as it then becomes a footpath rather than a road. This soon brings you down to the southern end of the garrison, where the path drops down and follows these low walls. 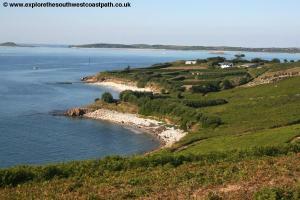 There is a little fort at the south east corner here which you can enter and enjoy fine views back to Hugh Town. Continue on the low path beside the garrison walls on your left soon coming to a large old foot, the Woolpack Battery, where there are more cannons. Continue along beside the wall or if you prefer, there is an arch through the wall just ahead on the left you can go through and follow a more coastal route. 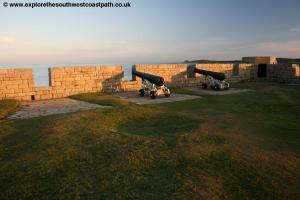 Whichever you choose you soon come to the end of the garrison walls as you reach the western most point of the island. 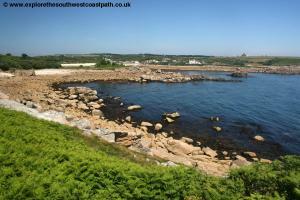 Here ignore the main track off to the right and continue on the smaller path with the walls still on your left and when they end continue ahead to the coast and turn right on the low coastal path. This soon brings you to another old battery, The Newman Battery. Continue on the walls path alongside the walls which begin once more. This soon brings you down to the front of a private house. The path goes round the front of the house and then along the road leading to it, soon coming up to the main road through the Garrison area and through the arch way leading up to the Garrison. The large castle building up the hill to the right is now a hotel. Go through the arch and fork left along the steep road going down hill (now part pedestrianised) and at the bottom continue on the steps to come out by the phone box. Go ahead to come out into the square in Hugh Town, by Calico Jacks, where the walk ends. 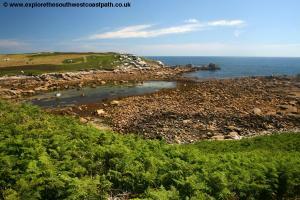 This is a circular walk so you finish back where you started. 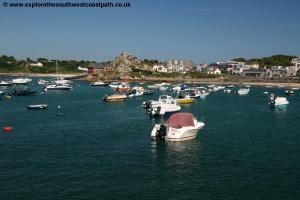 From Hugh Town and the main quay, boats leave to the other islands as well as the ferry service to the mainland at Penzance.